Once your mold is completed, the next step in the EVA injection molding process is adding texture. 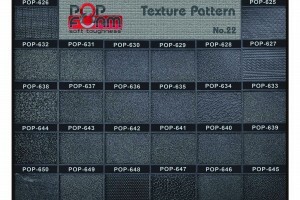 We can add any kind of your choosing from our texture plaque library that follows. Texturing, sometimes referred to as graining or engraving, is the process of adding a pattern to the molding surface of a mold. This allows the mold surface to impress that pattern on each molded part. For injection molded products, this is a process that allows you to create embossed areas or add custom text and logos. Textured foam can deliver looks of a natural or organic finish. They can also offer a range from a light matte finish to a deep leather or wood grain pattern. 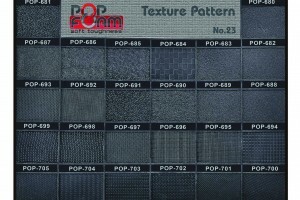 We can match most textures and patterns including those from Mold-Tech. 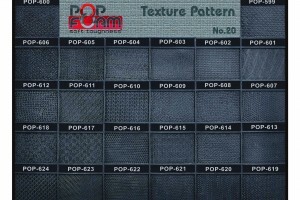 Texture can reduce the glossy appearance on the parts surface. 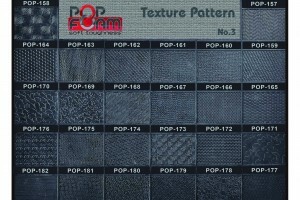 Textures will change the look and feel of your finished Popfoam product making parts look super tough or light and elegant. 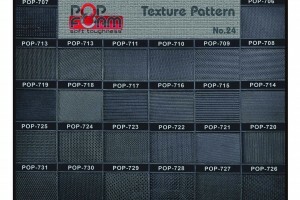 Texture can help hide some surface blemishes that naturally occur in the foam molding process. Injection mold texture can add better grip or traction to the finished part increasing touch and feel. Texturing will always add value and enhance your parts design. 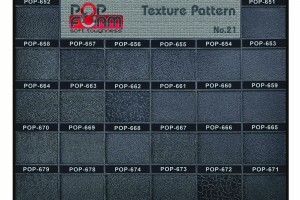 Click on the following plaques to enlarge examples of textured foam patterns and use your mouse to zoom in. Contact us today for more information about the US manufacturing, production, and design of our foam.